I have subscribed to Kirsty's blog, kootoyoo, for a long time. She lives in Melbourne, Australia, and has a "sometimes shop" here. 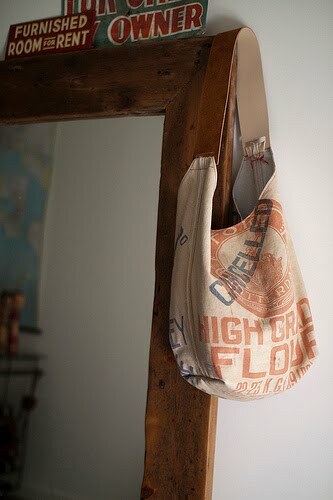 In a recent post she was showing this wonderful bag that she made from an old flour sack. Don't you love it? Something else in the above picture also caught my eye, though. Actually, two somethings...those signs sitting on top of the mirror. They came from my shop. I had forgotten about them, but I was so happy to see them again. Thank you Kirsty for that unintentional peak at their new home! It's just perfect. Thank YOU for having such a fabulous shop. That is really cool! I do love your shop. You have an excellent eye. I just sold a tape measure like yours. can you share me your facebook fan page ?